Animal rental costs are based on the location of the animal to the location of the event or production. The closer the animal is to the location of the event, the lower the cost of the rental. All prices are based on union labor rates for the number of trainers required for a eight hour day minimum. Also the cost of travel is added to the rental rates. The actual rental rate of the animal is figured per day on top of these other fees. Any big cat over sixty pounds must be displayed in a cage. 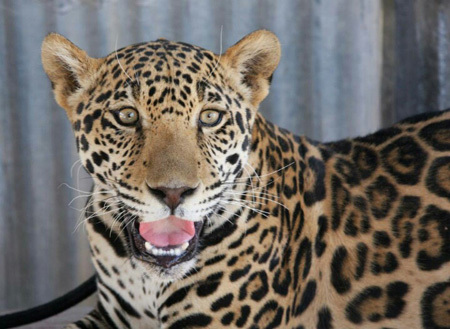 Any big cat display requires double wide doors to move a cage into a building and a display area with a physical barrier to keep the people away from the cage. If the cage is placed on a stage the ramp must be 5' wide and at no more than a 30 degree angle. All exotic animal displays require a display permit issued by the city or county of the display which must be secured by the client. The animals and trainers have their own permits and insurance but the event organizer must have their own display permit and insurance for the event. Except for educational purposes and small groups, exotic animals are not provided in some cities of Orange County California, West Hollywood, and Beverly Hills, or in any locations where a display is prohibited by law or which may be unsafe for the public. Call for more information. Check with your county authorities for location and permit requirements. Rental rates cannot be quoted on the phone and need to have an email request sent to us that contains the following information: Your name, company name, address, phone number. We also need to know the animal you want, what you need it to do in detail, and how and where you intend to display it in detail. If this is a film or video or photo shoot we need to know who it is for and all the details for the desired shot and action required. The lowest cost rentals are for static displays and action shots or special requirements will need one or more rehearsal day added on to the cost. In the Los Angeles area the typical cost to display a big cat like a tiger would be $3500. A smaller cat like a Leopard would be less and a large male Lion could be more depending on the location and display requirements. A Giraffe is typically $3200 and a Zebra is typically $2000. An Elephant if available in the LA area is usually over $7,000. East Coast prices are higher. All rentals require a written proposal and signed contract with a 50% deposit and full payment at the time of delivery to the location or payment in full for short notice rentals. In some circumstances the labor costs are handled under the production company directly seperate from the rental and travel charges. 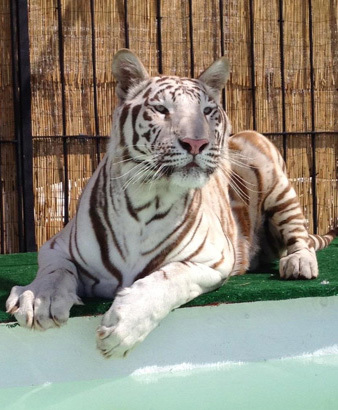 A white Tiger for rent in his enclosure. below: an adult Leopard for rent.